One of the crispest and cleanest looks that you can go for during the summer months is the preppy style, which looks effortless, cool, collected and expensive and is one look that anyone no matter what shape or size they are can pull off. And the great thing is that since it is such a classic summer fashion trend, you can be sure of it always being in style, meaning that whatever you buy can be seen as an investment. We’ve picked out our favourite 5 preppy pieces that will have you looking great in the summertime. The preppy look tends to be all about neutral and pastel colours, classic silhouettes and natural fabrics, so a polo shirt is a great piece to get out there and buy. To update it a bit though, we love this cropped version from Puma X Fenty that will look great for your own take on the preppy look. We love the pale pale pastel pink that will go great with a tan, and its basic silhouette. We found it over at JD Sports for £100, but if you want to try to save a bit of money, then we recommend that check out a JD Sports discount code first if you’re shopping online. Chinos are a quintessential part of the preppy look and the great thing is that they’re really practical during the summertime anyway. Gap is known for its great choice of chinos so that’s why we’ve turned to them for these lovely pale blue ones. Available in sizes 2 to 24, even better they are also available in different leg length too and are currently in the sale so grab yourself a bargain! A pair of good quality brogues is ideal when it comes to emulating this look and again, you should see these as an investment, and these tasselled ones from Office will see you through from spring to autumn with ease. In black patent leather and suede these are a great shoe that will be wonderful no matter what the weather, and at only £69 a pair, we only wished that they did more colours! When you are out and about, then a cross-body bag is perfect for carrying about all of your accessories without being weighed down, so we love this dainty rose-pink one from Longchamp. A designer bag doesn’t always have to cost thousands of pounds, and this lovely version comes in at a reasonable £365. Available in 5 different shades, the gleaming gold chain and buckle really set this bag apart as a luxury item. 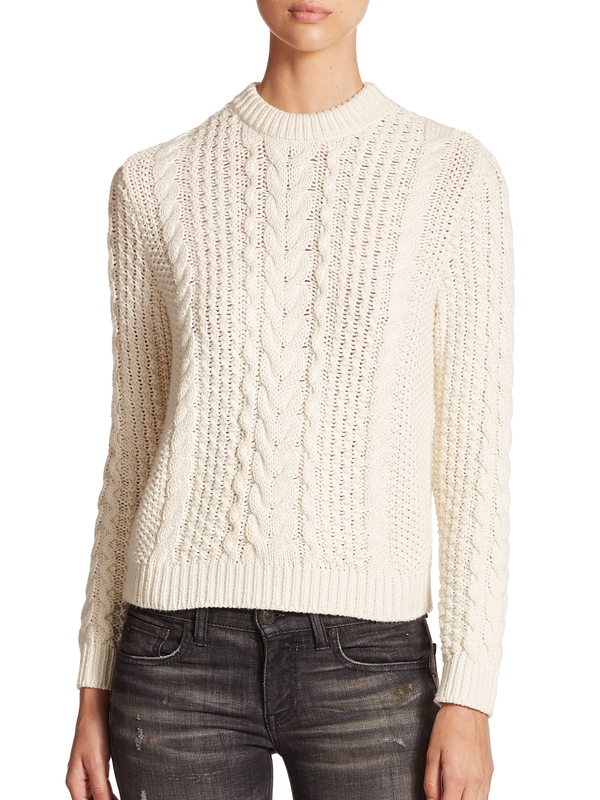 And finally a must-have piece to emulate the upmarket preppy look is of course a cabled crew-neck sweater from where else but Ralph Lauren. We love the classic cream colour which will go with any top and any trousers from pin-stripes to polo shirts, and if cream isn’t for you, then there are loads of colours to choose from such as pastels to brighter blues and purples and more. It costs £109 but will last you for years.